Peek Spray Away is a universal foaming cleaner for Upholstery, Leather, Carpets, Glass, Plastics, Wood and Vinyl, all of the areas you can't use your Peek paste and liquid cleaners! 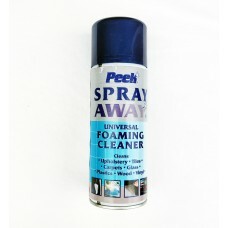 A blend of detergents and solvents in a foaming aerosol formula. Removes grease and dirt from all types of surfaces.